This is a pair of tall elegant silver plated candlesticks made from nickel. They come with a tray that is decorated with a fig tree design. They are meant to used on Shabbat, holidays or special occasions with regular sized wax candles. Observe Shabbat and Jewish holidays by fulfilling the Mitzvah of the candle lighting ceremony with these two elegant candlesticks. They are made from nickel and feature a sleek classic design with a tradition shape. The mouth of the candleholder and base of these tall candlesticks are decorated with a pattern of small hammered clumps. The candlesticks can be used with any regular sized wax candles for any occasion. 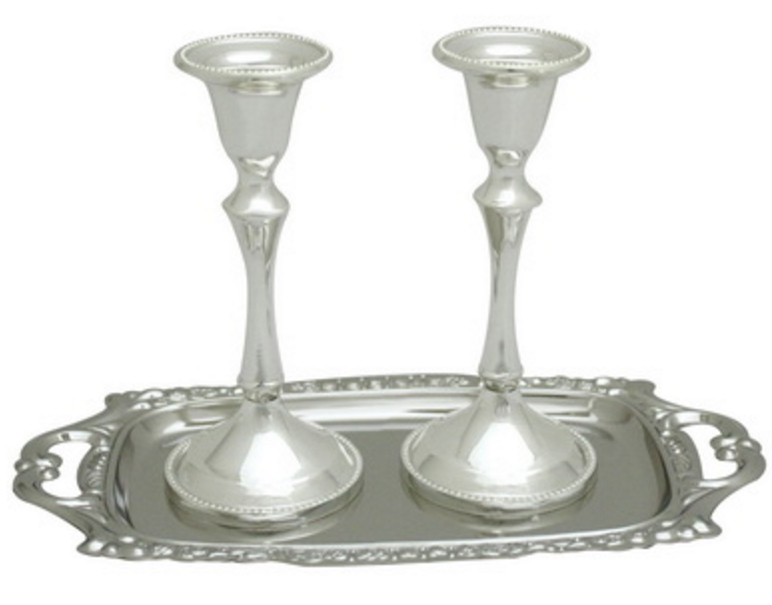 These Judaica items come with a nickel tray that has a fig tree design on its border and cut-out handles that make carrying the candlesticks around an easy task. The exquisite candlesticks make for a lovely housewarming or wedding gift idea. Candles and candlesticks are used by jewish people across the globe to observe the Jewish Sabbath (Shabbat). This is done by lighting candles 18 minutes before sunset on Friday evening. This is a ritual reserved for the women of the household but the men do it in their absence.